It used to be that disposable cameras were the only piece of video equipment anglers kept on-hand to commemorate their trophy fish. Over the years, though, equipment such as high-end DSLR cameras and GoPros have allowed anglers to bring fishing into new realms. The rise of YouTube has seen thousands of anglers create their own channels where they video blog their trips and share tips for viewers. 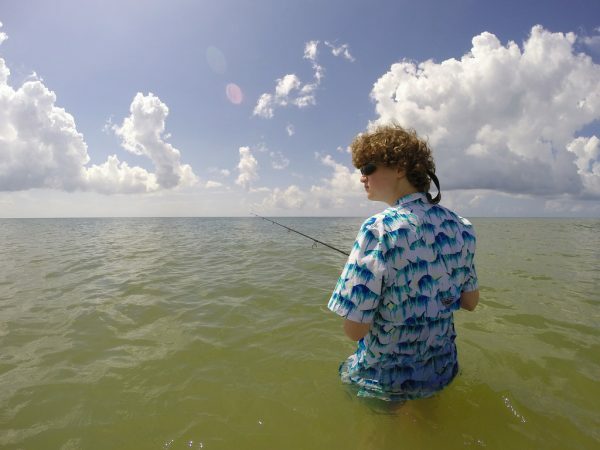 If you’ve been considering taking your fishing game to the next level of documentation, here are three tips to get the most out of your GoPro. Head straps work just fine for shooting with your GoPro, but you’ll find that your head moves around more than you realize, leading to shaky videos. If you don’t want to look like you’re shooting a sequel to Cloverfield, I suggest investing in a chest harness for your GoPro. The center of your body doesn’t move nearly as much as your head will, so mounting a GoPro to your chest will yield consistently stable video. Chest harnesses aren’t expensive at all and if you’re really serious about creating high-quality videos or starting a YouTube channel, it’s definitely worth it to invest in on. When it comes to capturing the moment when you land a huge fish, getting it right makes all the difference. However, I’ve seen a lot of beginners make the common mistake of mounting their GoPro to their net’s handle. This means you never get to see the underwater action leading up to the big moment where the fish is landed. To get the best angle, it’s smart to mount your GoPro to the net’s hoop, about halfway between the handle and the front rim of the hoop. This way, the GoPro’s wide-angle lens will capture the last few moments of the fight and scooping the fish. Anglers using a GoPro have attached the small camera to everything from their rod handles to oars in order to gain a few extra feet and get a better angle on the fishing action. This may work fine in a pinch, but it’s easier to simply have a dedicated pole for this job. Whether you want to invest in an extendable pole or simply affix your GoPro to an old golf club, just having a specific tool for this is helpful. Bonus Tip: A 6-foot garden stake from your local hardware store works fine, only costs a few bucks and is designed to be stuck in the ground and stay put, making it perfect for holding a camera in place.